Back at It in Bogotá – Where is Lydia? I arrived in Bogotá, Colombia at 1am and I was running on little sleep since I had to be at the airport in Seattle at 3am the previous morning. Someone had told me to only take a yellow cab from the airport and not with one of the many “cab drivers” who bombard you when you exit the airport. Chances are they would have been fine but I didn’t want to risk it and get kidnapped my first night in Colombia. I arrived at my hostel, El Pit, located in the La Macarena neighborhood near the bullfighting stadium around 2am and fell fast asleep. Hedi and I with out new friend Blake outside of the El Pit hostel. In Oaxaca, Mexico I had made a friend named Hedi from Austria who was also traveling solo. I had told her my plan to come to Colombia to celebrate Carnival in Barranquilla at the end of February and invited her to join me. We made plans before parting ways in Mexico to meet up again in Colombia. Hedi met me at my hostel in Bogota the following morning. We fell right back into our groove and it was like we had never parted ways. While traveling in Mexico Hedi and I met a Colombian couple, Alejandra and Diego, who live in Bogotá. I contacted Alejandra when I arrived in Bogotá and she invited us to meet her at her boyfriend Diego’s restaurant that afternoon. Diego owns the cutest, homiest feeling café that sells local coffee and chocolates. All the recipes are his own and you can tell all the dishes are made with love. It’s a great place to go to get a break from fried Colombian street food and treat yourself to a healthy salad and a great cup of coffee. It’s the kind of place you could spend all day at. La Candelaria, a neighborhood in South Bogotá. La Candelaria is full of beautiful old buildings and street art. While I never experienced any problems in Colombia it’s best not to be out in this area after dark. When we arrived at Diego’s restaurant, La Castaña, Alejandra was sitting with two friends, Miguel, a death metal singer turned Buddhist monk turned yoga teacher, and Natalia, a fashion designer who owned a small shop in the same building as Diego’s restaurant. Colombians are the friendliest, nicest people I have ever met. Suddenly we had two new friends. Alejandra was planning on heading up to the mountains in Sutatausa the following day to stay at a friend’s hostel and learn how to slackline. She invited us to join her and insisted we stay with her and Diego after that. How could we refuse? All the local goods for sale at the cute neighborhood cafe, La Castaña. That night Hedi and I met up with a guy named Alejandro who had contacted me through Couchsurfing. I always post public trips on the App before I go anywhere. Posting a public trip means you are telling the Couchsurfing community what city you’ll be in and when, that way people can offer to host you or show you around. It is extremely helpful, especially if you are traveling solo. We met Alejandro at Colombia’s version of Starbucks, Juan Valdez. Alejandro is a super hip DJ and club promoter. He gave us a tour around the Chapinero neighborhood and suggested we should go to a Colombian chain restaurant called Wok for dinner. Generally, especially in the US, I am against chain restaurants and would rather eat at locally owned places. In Colombia it seems to be a little different. Most locals, at least the ones who live in major cities, frequently eat at chain restaurants. I highly recommend two Colombian chain restaurants, Crepes and Waffles and Wok. Bogotá is famous for its beautiful street art. After dinner, Hedi and I ordered an Uber pool to head back to El Pit. We got into what we thought was our Uber and another guy got in as well. He looked puzzled and said he didn’t order a pool but the driver seemed okay with it so he got in. We thought nothing of it since we ordered an Uber pool, meaning other people who are going the same direction ride with you making the price less expensive. We began talking with the other passenger who spoke fluent English and wore a suit. On the ride I got a notification that our Uber ride had been cancelled. I thought it was a little weird since we were already in the Uber but thought nothing of it. After about 10 minutes the other passenger asked us where we were staying. When we told him the La Macarena neighborhood he said it’s all the way across town in the other direction. We realized we had gotten into the wrong Uber. We got out at his stop and ordered another Uber. After traveling solo in Cuba and Mexico and having no problems I had no fear of anything bad happening in Colombia. Hedi, on the other hand, seemed to be a little on edge waiting on the street corner for our Uber and began telling me the crazy story of what had happened to her on her first night in Colombia. Plaza Bolívar is always covered with thousands of pigeons. Apparently, when the cab driver went to drop her off at her hostel in the La Candelaria neighborhood, there were two very sketchy crack heads waiting for her. The cab driver told her to stay in the cab and even had a gun in his hand. They circled the block a few times and after the crack heads had left she finally got out and went to her hostel. Okay, now I was a little on edge. The Uber driver picked us up and we began driving towards our hostel. On the way we approached a bridge with hundreds of sketchy looking Colombians hanging out underneath. They weren’t letting cars pass underneath the bridge. Some of the cars in front of us were turning around. I asked the driver what was going on and he kept saying, “Tranquilo,” which means calm down. He kept inching towards the bridge. Looking at how we were completely surrounded by Colombians I kept asking the driver if we should turn around. “Tranquilo”, he said again. I was completely sketched out. What was happening under here? At this point, I asked the Uber driver if he had a gun. He laughed. All of a sudden we heard a gunshot, my heart sank to my stomach, and I dropped to the floor of the car. “Oh my God! We’re going to die! !” I thought. The two cars who had been stopped under the bridge took off at full speed. Then I realized they were drag racing and the gunshot had meant Go! We all started laughing. I can’t remember the last time I had been that scared. When I travel I like to be very aware of my surroundings but also have the mindset that nothing bad is going to happen. Life is too short to be on edge all the time and it’s definitely too short not take risks for fear of what might happen. El Pit is located in the La Macarena neighborhood. La Macarena is safe to walk around, even at night, and it’s full of great restaurants. El Pit is a new hostel owned by a young Colombian couple. The beds are extremely comfortable. I call them marshmallow beds since the comforter is big, white, and fluffy, like a marshmallow. They have hot showers, and delicious breakfast is included. They also serve a great lunch every day. La Castaña is a great place to grab a healthy delicious meal in the Chapinero neighborhood while supporting a local business. Everything I tried here was delicious and they offer many vegetarian options. They offer food ranging from salad, sandwiches and soup, to burgers and fries and curry. La Castaña also serves delicious coffee and baked goods. It has a great vibe and is a great place to spend the afternoon with friends. Wok is an Asian restaurant serving Thai, Chinese, Vietnamese, and Japanese dishes. They even have sushi. Their menu also lets you know which menu items are vegetarian, gluten, and dairy free. Crepes and Waffles has just exactly what the title might lead you to believe they serve. They have over a hundred different savory and sweet creeps and waffle creations. They also have a wide variety of salads, fresh juices, a salad bar, and amazing ice cream. I only ever had the salads here and was never disappointed. Uber is the easiest way to get around the city and very affordable as most rides are under $4 USD. There’s a feud going on between Uber drivers and yellow taxies so someone always needs to ride in the front seat with the driver. I’m a big fan of Uber pool which makes the ride less expensive and I frequently had great conversations with the other Uber passengers while practicing my Spanish. Yellow cabs are everywhere and easy to hail. The drivers seem to know their way around the city a little better than Uber drivers but the rides are usually more expensive. Transmileno is Bogotá’s bus system. I only used it a few times. It’s very inexpensive at around .75 cents USD one way. However, I found it very confusing to use and the buses were usually very full. OMG! Just this morning, I read your story about the Uber driver in Bogota, being evasive and driving you and a friend into a seedy part of Bogota, circling around crack heads and under bridges. You notice your driver has a gun. Then, suddenly everyone hears gunfire from your surroundings and you scream and “hit the floor” of the car. I almost ran upstairs and gave you a big hug (waking you up at 8am!) These type of tales make a mother’s heart beat faster. Soo happy you are back home and I didn’t read this story while you were still traveling in South America. Haha, awe Mom! You’re so cute. It’s not an adventure without a little excitement! OK, I see you did keep traveling! 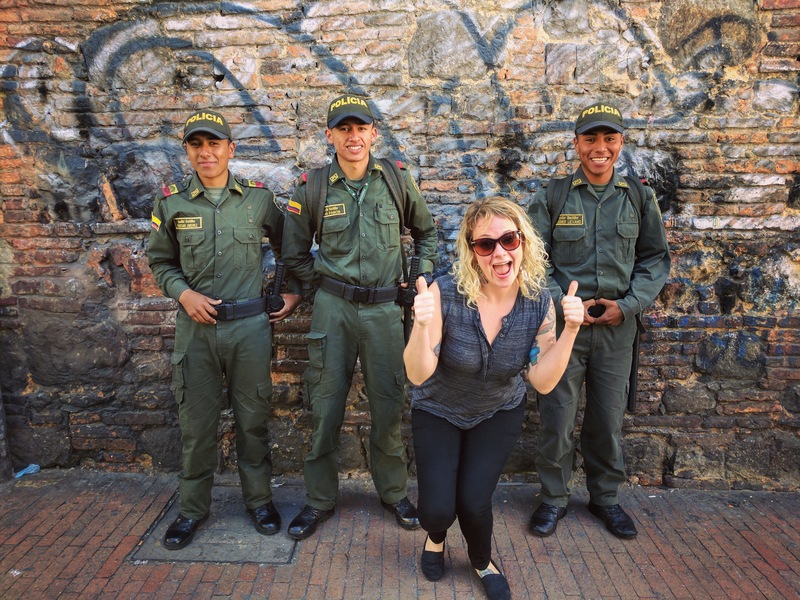 We loved Bogota and, like you, felt perfectly safe there. Also like you, we stay very alert but have the mindset that people are good and that nothing bad will happen. And usually that is the case! We had some funny Uber stories in Bogota but most of them involved cramming 5 of us into one of those little cars! Wow. A great story to tell and lucky it had a fun and safe outcome!